Simple and fast to install, this adapter has been designed to receive all the training modules of LEADER range. With the shape of a funnel, this adapter allows to concentrate the flames produced by the fire trainer inside the module. The adapter allows the installation of training modules on GF42 and AEROS 2 fire trainers. Allows to concentrate the flames inside the module for an even more impressive fire. 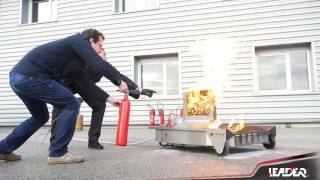 Compact, lightweight, water-free, easy to transport and install, it generates flames of 1.20m high on 0.42m².